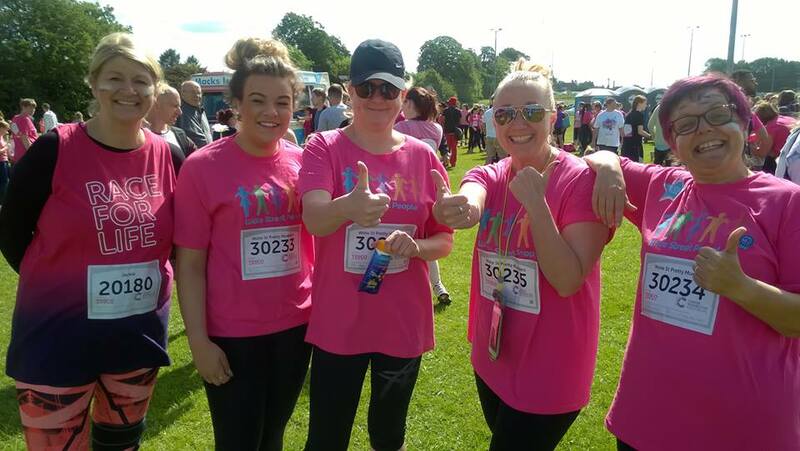 It all started 2 years ago, when Madelaine took part in the Brutal 10k as part of our 25th Anniversary celebrations (celebrations?? Well, we decided to raise money for Basingstoke Consortium as a way of celebrating). The rest of the team went along on a cold Saturday November morning to watch Mad go through hell. Strangely, we thought it looked like fun. Two years’ later and with a rigorous training schedule behind us of doughnuts, crisps, sedentary lifestyles and general idleness, we thought we were ready! 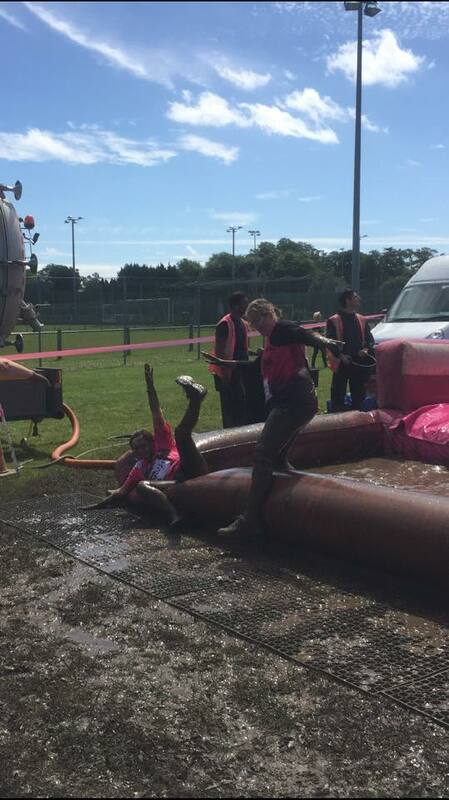 What attracted us to the Race For Life’s “Pretty Muddy” were the phrases in the advertising, “for women of all abilities”, “walk at a conversational pace”. This was the race for us! Our team comprised o f Maxine (unfit and suffers from vertigo), Madelaine (runs most mornings to allow her to eat more), Tracy (walks the dog every morning and bicep curls with a G&T occasionally), Kyra (young whipper snapper who likes to party hard). We also had Jackie Bennett, the MD of The Employment Agents’ Movement, who used to run until she did her knee in and needed an op. You can imagine it can’t you – the alumni of the fitness world! We really wanted to take this seriously, so we had some T Shirts printed and thought about training. Thought and thought and thought. Suddenly it was the day and very little actual training had taken place, other than walking to Waitrose for ice creams. This was definitely out of most of our comfort zones. 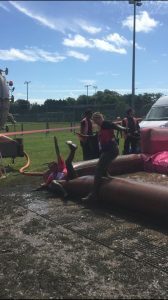 Not just the exercise, the mud and the obstacles but thought of congregating with hundreds of other women, dressed in pink in a field, in Basingstoke. But that’s what it’s all about. Taking you out of your comfort zone to raise money to help eradicate Cancer. How many people each year have their life devastated by a diagnosis that potentially limits the rest of their life? Now that is being taken out of your comfort zone. Surely, we can all endure a bit of discomfort in order to raise funds towards cancer research. Mad & Kyra set the pace by jogging in front, Tracy, Jackie and I did as we were told and walked at a conversational pace. It was great fun! Crawling through tunnels, bouncing on space hoppers, scrambling over cargo nets and definitely getting muddy. The camaraderie was palpable, people helping each other climb over, under, through. Community spirit was definitely alive and well. So, what conclusions can we draw from all this bonhomie? If you’re struggling with life, don’t crawl back in your safe shell. Take a step outside your comfort zone, try something different – you’ll be amazed who’s out here to help you. Wote Street People is an independent job agency in Basingstoke, established for over 28 years, we have an excellent reputation within the Basingstoke job vacancies market. We find our candidates permanent, temporary, full time and part time jobs as well as providing organisations with quality staff. If you need staff or a job then call us 01256 799127 or email maxine@wotestreetpeople.co.uk.